Our honourable founder and patron displayed tremendous foresight in the early days of our inauguration by his insistence that we not only teach basic Qur’an and Tajweed, but also the advanced classical Islamic Sciences (i.e. IHE) so that Islam may be propagated in this country by its own citizens. Our current IHE course is commensurate with other aspects of our school in its development and progress. Our ascension in this particular field marked a milestone in 2004 when we started the teaching of Kamil – the final year in the IHE Course which includes the teaching of some of the most sacred, famous and advanced books in Muslim literature. Our dedicated teachers deliver lectures on such texts as Bukhari, Muslim and the other Sihah Sittah. However, we are not confined to Hadis studies alone, our lecturers also teach world renowned treatises in Tafseer, Usool, and Hanafi fiqh amongst various other fields. Intensive study of the translation and commentary of The Holy Qur’an; the history; how it was revealed, recorded and preserved; terminology related to it; types of Tafseer and the principles of Tafseer. The study of the sayings and teachings of the Prophet Muhammad (SAW). Similar to Ulum Al Qur’an, students will study the translation and commentary of the Hadis. To complement this noble knowledge, students will also study the science of the ‘principles of Hadis’; the knowledge of Rijal; and the different types of Hadis. Islamic Jurisprudence or Sacred Law, which details the laws and commandments of Allah Tala regarding all aspects of human life according to the Hanafi school of Jurisprudence. Students will be progressively guided through books of Fiqh, beginning with Quduri, through Sharhe Wiqaya and finishing with the Al-Hidaya throughout the first three years of the course. 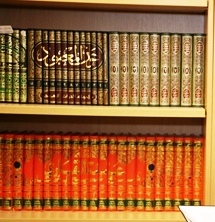 The study of the Arabic language includes both classical and modern Arabic literature. Extensive study of Arabic grammar (Sarf and Nahw). Sarf deals with the structure and formation of Arabic words and etymology. Nahw deals with the structure and formation of Arabic sentences. Study of the principles of Arabic eloquence and linguistic beauty. The study of Islamic History from beginning of time, including the creation of Adam (AS), the Seerah of Prophet Muhammad (SAW) as well as other major events of classical and modern Islamic history. Study of the methods of self-purification in the light of Quran and Sunnah. Students will be studying the texts written by great Sufi masters. Thorough study on the commentary of a world famous Tafseer by Qadi Baidawi (RA). Students will also study the Al Itqan Fee Ulum Al Quran, the famous work of Imam Jalal Uddin al Suyuti (RA) which will complement their study of Tafseer by enunciating on the principles of Tafseer. To apply for the IHE course, please download the application form and return to the school office. The yearly tuition fees are £1750. An admission fee of £50 is payable. Public examination fees must be paid in full prior to taking exams. Fees can be paid either in full, in which case there is a 5% discount. Or fees can be paid in three-termly instalments or in 10 monthly instalments by direct debits. For further information please contact the school office.